Imagine a place where children can steer a dhow boat across the Indian Ocean, sell Egyptian spices and Moroccan rugs, hop on a camel and embark across the Sahara. “America to Zanzibar: Muslim Cultures Near and Far” is a groundbreaking interactive museum exhibit in the heart of New York City that lets kids do just that: explore the A-to-Z of Muslim cultures. CMOM’s executive director, Andrew Ackerman, says the addition of the Muslim cultures exhibit allows families an opportunity to discuss unity and diversity within the same tradition — a factor he says is crucial for developing young minds. Across from the courtyard, next to a life-size 900-pound camel, is the "American home" living room, made up of clothing, artwork, photos and books donated from American Muslims of all walks of life. On the coffee table, there is an app that teaches you how to write and say “My name is …” in 24 languages spoken by Muslims in New York. The city’s mayor, Bill de Blasio, has praised the exhibit as an “important cultural resource,” calling New York Muslim residents a “vital part” of the city’s diverse communities. Independent research from the American Association for the Advancement of Science indicates that children in the U.S. begin to understand the concept of race and ethnicity by the age of four. By the time they turn five, children may have already developed solidified stereotypes about various social groups. Lizzy Martin, director of exhibit development and museum planning at CMOM, says the exhibit employs a multifaceted approach to engage children, in order to suit their individual learning needs. 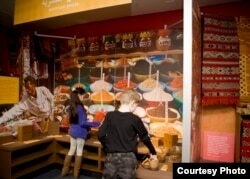 Visitors can smell the spices or fruits that are part of the exhibit on Muslim cultures, says Lizzy Martin, director of exhibit development and museum planning at the Children's Museum of Manhattan. For the kinesthetic learners, the exhibit features a music-making booth using digital versions of popular instruments, such as the oud, ghijak or kora. Fans of panoramic images (and IMAX theaters) can marvel at the architectural beauty and variation of world mosques beneath a 21-foot curved screen, transporting you at the speed of light from a bird’s-eye view in outer space to a prayer room rug on the ground floor. Ackerman describes the exhibit, and the museum as a whole, as a microcosm of “the real heart and soul of America”: a place of hope; a safe haven for families. After the September 11 terrorist attacks in 2001, he felt a brief moment of uncertainty about the museum’s future.